How much is it to reserve the trailer? There is a $50 fee due at the time of reservation. The $50 reservation fee helps with the ongoing maintenance and resourcing of the trailer as well as someone to help you set up and tear down the contents. What if I cannot afford the reservation fee? The $50 reservation fee should not hinder you from reaching out to your neighborhood! If you and/or your neighbors are unable to pay the fee, please contact the church office, and we will work with you. In order to make the trailer available to as many people as possible, only cancellations within one week of the scheduled reservation will receive a refund ($50). Inclement weather will be an exception. What are the vehicle requirements to pull the trailer? The trailer will require a 2” ball, 4-way connector and a vehicle that can safely tow 3,000 lbs. If you do not have or are unable to find a way to tow the trailer safely, please note that in your reservation or contact the church office as soon as possible. We will attempt to find an alternative for you. Will someone help me set up the contents of the trailer upon delivery? Yes! A trained individual will help you set up and inspect the contents of the trailer to ensure that they are in good working condition. This person will also help you tear down the assembled items and ensure that they are returned in good working condition. Which inflatables come with the trailer, and what are the dimensions? Depending on the size of the yard, a trained person can set up as much or as little of the contents of the trailer. Here are the links for the current list of inflatables with descriptions and dimensions: Misty Kingdom, Magic Combo, and Little Tikes Jump N’ Slide. Water features on inflatables are unavailable. Should I contact Gopher State One Call beforehand? We strongly recommend that you contact Gopher State One Call at least 48 hours in advance of your Block Party to help avoid costly damages and personal injury from 18” steel stakes that are into the ground for the inflatables and canopy tents. Please note that inflatables can cause damage to a lawn even through regular use. The inflatables and canopy tents will not be set up on hard surfaces, such as asphalt and concrete, to help with safety and longevity. What are some requirements to run the inflatables? The inflatables must be placed on a truly flat surface. There should be a dedicated electrical outlet on the exterior of your house or inside of your garage for each inflatable. The outlets should ideally connect to different circuits, and be no further than 100 feet from the setup area. What are the liabilities and/or risks? Can I use the trailer and contents for something other than a block party? 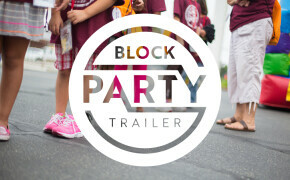 The Block Party Trailer is a resource provided by Constance Free Church for the sole purpose of neighborhood block parties and sanctioned ministry programming. What if I am not a regular attendee of Constance? Only regular attendees of Constance Free Church can reserve the Block Party Trailer, but you do not have to be a voting member. What is a typical block party weekend schedule?